Are you looking for the little known ways to spy on the traffic of other websites? Do you want to know how much traffic a top blog in your niche gets? If yes, you’re in the right place. Checking website traffic of your competitors is an effective way to find out what’s working and what’s not working on any niche. but prior to that let’s see what web traffic is and what does it mean? According to Wikipedia, Web traffic or website traffic is the amount of data sent and received by visitors to a web site. This necessarily does not include the traffic generated by bots. Since the mid-1990s, web traffic has been the largest portion of Internet traffic. This is determined by the number of visitors and the number of pages they visit. If you want to see your own website traffic, you can use various tools like Google analytics or clicky but if you want to check other people’s blog traffic you have to use some tools, Today, I’m going to share few effective ways to find website traffic report of any site for FREE. Why check others website traffic? You may ask, why do I even need to find website traffic of my competitors? Here are few benefits of estimating traffic or unique monthly visitors of a website. You can get estimated monthly or daily sessions any of your competitor website is getting. You’ll know top traffic keywords. You can target the same set of keywords to drive more search traffic to your own website. If you are looking for different ways to check website traffic for free, don’t skip this post, let’s find out those tools now. 14 Ways To Check Website Traffic For Free Online: Check web Statistics easily! Here is the ultimate list of tools that you can use to check website traffic of your competitors or any website of your choice for completely free. Let’s dive into the details without much ado. Whether you know it or not, SEMrush is the best recommended tool by most SEO experts. If you want to estimate the accurate traffic of any website, use SEMrush. It not only helps you view website traffic but it gives you a list of all the keywords that are helping your competitors to grow their search traffic. How to find website traffic using SEMrush? If you have a SEMrush account just log in to the dashboard and enter the website URL of the site whose visitor count you want to know. Then you get the result like something shown below which not only tells you other website traffic but also gives you a breakdown of any paid traffic they are driving to their site via programs like adwords. You can also use SEMrush to find the right kind of affiliate products to promote to increase your income, come up with the high performing keywords to boost your overall website organic traffic, check and analyze the backlinks of any site and many more. A GREAT News: I’m giving away 14 days free access to SEMrush Pro account to BloggersPassion readers. You just need to sign up using your credit card details to claim SEMrush pro version worth $47. You can read my unbiased review of SEMrush and claim this deal from this link. It’s ONLY for BloggersPassion readers and you won’t find this deal anywhere so claim it before the deal ends. If you want to read a detailed and unbiased review of SEMrush, please click on this link. You will find a lot of information on how to use SEMrush to overtake your competitors no matter what your niche is. How to take advantage of this deal: Since I am offering you a 14 days of Free SEMrush usage, you can now check website traffic online for free and know how much traffic which website is getting. Apart from that, if you yourself have a website, you can spy on your competitor traffic, see what backlinks they make, what profitable keywords they rank for and use them for your advantage. You can do that repeatedly for 14 days and get enough data to work on for free! Quick Note: Do you want to start a blog? Here’s a simple step by step tutorial on starting your own WordPress blog within 10 minutes in 2019. SpyFu is a powerful SEO tool which is not only useful for website traffic analysis but also for finding the most profitable keywords and ads for paid and organic search. It exposes the search marketing secret formula of your competitors with ease. It is a well designed SEO tool packed with metrics and features specifically geared toward sales, online marketing and digital advertising. You can easily check website traffic with accurate data. If you’re into Adwords campaigns, this is a must have tool. It helps in tracking your keyword rankings. You can monitor your paid and SEO rankings on Google, Bing and Yahoo. It helps in eliminating bad keywords. You can improve your ranks by tapping into your competitors’ keyword strategies. All in all, SpyFu is one of the best tools to check website traffic with ease. It is also useful for growing your search traffic and tracking your keyword positions on Google search results. After SEMrush, I highly recommend you to check out Similar Web to estimate the traffic of any site worldwide. Similar web is the fantastic way of checking any website traffic for free. You just have to go to their website and type in your desired website name to find out the traffic levels of the site. It not only provides you the most competitive insights about any site but also gives you ranking insights for any website. You will not only get the traffic stats of any website, but you will also get the details of how many pageviews it is getting, how much time every visitor is spending, referrals, bounce rate, social influence etc. you will get almost all the results. That’s fantastic information you could get from a free website traffic checking tool, right? Here’s the screenshot of Bloggers Passion, though the results are not so accurate, but I still liked their data and the precise information that they got in some cases. Here’s the screenshot of actual traffic data. The above screenshot gives you a detailed list of the monthly visits a site gets along with the estimated monthly site visits and the average time a user spends, total number of pageviews and the bounce rate of a site. You can use similar web to know the daily unique visitor count of someone else’s website and even the top destination sites which is no other than the sites people visit after landing on your test site. Pretty detailed information offered by a free traffic checker tool, right? Now Google Ad planner is replaced by Google Display Planner where you can guess what amount of traffic a website gets. Google display planner is the combination of three long time AdWords tools, the Contextual Targeting Tool, Placement Tool, and Google Ad Planner. Google Display Planner is the most accurate ways to measure a website traffic, after all it is created by SEO gurus in the industry and you will check any website traffic for free using this tool. I would strongly recommend using Google display Planner as a reliable blog traffic checker because whenever I use it, I get accurate results regarding my websites. This traffic estimating tool from Google will give you important traffic metrics like average number of visits per visitors, average time on site, unique visitors, total pageviews, total unique visitors to a website in month time and broad category for the entered website. To start using Google display Planner (one of the effective website traffic checker tools) to check traffic to a website, enter the desired website domain name in the “Get ideas and estimates”section’s landing page URL then click on “Get ad group ideas”. You will now come up with “Available network inventory” impressions that the site you enter. I have analyzed data available from Google display Planner with the traffic details of some websites I own and I find data available from Google Ad Planner very close to my website original traffic numbers. How to use Google display planner to check website traffic? Here is a video tutorial demonstrating how to find website traffic of other websites for free (using Keyword Planner). The above video gives you a summary on how to use AdWords display planner to find golden keywords that not only increase your visibility but also sales. It also gives you the estimate monthly search traffic of any site you are targeting. One of the best website traffic checker sites is Alexa. I know you are very much familiar about Alexa, after all, we all love to see Alexa rank each and everyday right? Do you know that by using Alexa, you can check any website traffic for free? Yes, it is possible to find any website traffic using Alexa search box. In fact, this is the first method newbies use to know the details of other blogs including average on-page time, bounce rate and unique visitors per month. Go to Alexa.com website and enter a website address in the Search Box available. After entering website address, you will get important metrics like Alexa Traffic rank (Global), Traffic Rank in Specific demographics like for India specific website, Alexa Traffic Rank in India. Apart from Alexa rank, you will see other website traffic numbers like page views, pageviews per user, bounce rate, time on site and search percentage. You will also get list of top search queries for a website. So these search queries can be considered as best performing keywords for that website. Apart from this, Alexa also ats as a free website traffic comparing tool, you can use it to compare your website traffic graph with 4 websites of your choice. Alexa.com will not give any traffic estimates for new or websites with few daily visits. Alexa is undoubtedly the best website traffic checker tools out there. The data available from Alexa.com is not accurate but you can make your own prediction about the traffic numbers about a website after using this tool. Ahrefs is another trusted website traffic monitoring tool. It is actually much more than that but as for the scope of this tool we will cover the website traffic tracking features of Ahrefs. Like SEMrush, you log in to the dashboard of it and enter the domain that you want to know the traffic details of. I entered Backlinko because everyone wants to know how much traffic does Backlinko gets and what are its unique visitor estimates etc. And Ahrefs took no time and handed me the traffic details of Backlinko. See the screenshot below. You can further dig into the results to know the top traffic pages of Backlinko (or any website you enter) and get more traffic details. For this, you can read my SEMrush vs Ahrefs article where I have mentioned more ways to use both of the tools to get awesome competitor statistics. You need to know what traffic your competitors are generating if you are into the field of digital marketing or blogging. And you know, this information is so valuable to grow your traffic and sales. But the fact is, this information is not freely available. If you gather more information about the traffic over years, you can easily analyze your competitors. If you’re a blogger, you already know the importance of Alexa traffic ranking. With Alexa ranking, you will get traffic ranking information. This is a free Alexa alternative which has even better algorithms to check website traffic easily. So how you can use this information? Start comparing site visitors of yourdomain.com and yourcompetitor1.com, yourcompetitor2.com, etc. You can identify leaders in your niche and understand who has more visitors than you do and who has less. You can easily estimate your competitors traffic even before launching website or blog. You can also analyze trends, pros and cons of your competitors to get an edge over them. Estimating traffic of a website is bit hard with few tools most of them don’t give you accurate results but My Site Wealth is one of the few tools that can be used for finding accurate data of a site. It has amazing features that you can estimate website price, traffic and domain value. By utilizing the available data and by gathering and breaking down information from web assets, you can evaluate the estimated website price. With PageSpeed Insights you can determine ways to create your website quicker. It also helps you to understand regarding page speed of your website. You can check free Domain Authority (DA) of any website. You can track daily, weekly and monthly visitors. It has Alexa rank comparison tool that compare two or a lot of sites Alexa ranks and traffic stats. You can also check out your current traffic source of website. This tool also shows internet rank and SEO stats of current web page, backlinks, quick access to Geo IP Location, indexed pages and more. So without a doubt, this is a perfect website traffic estimator tool. 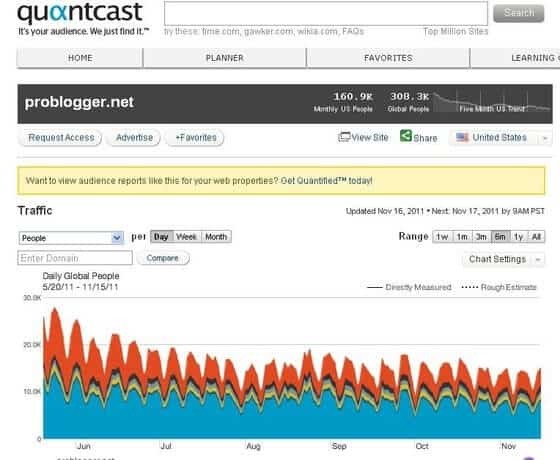 QuantCast is another popular website traffic checking tool among internet users. Quantcast is a digital advertising company, founded in 2006, that specializes in audience measurement and real-time advertising. Quantcast is the perfect free website traffic estimator that provides you free direct audience measurement including the traffic, demographics and many more details like their interests etc. In my testings, I found Quancast consistently shows less visitor count than analytics so I am not sure how accurate it can give traffic stats of a particular website, but it is definitely worth considering. Note that, a website or blog with a small number of unique visitors will not necessarily display results due to insufficient data. So if your blog or website doesn’t have decent traffic, this tool is of no use for you to measure your website traffic. So you have to again depend on your Google analytics metrics to precisely get your website traffic data. This is a working website traffic checker to estimate traffic. In the above screenshot, the tool is showing you the daily unique visitors a site gets and also showing the graph for every single month. Give this tool a try and you will play with it very often as I do. Basically BuySellAds (BSA) is an ad network for selling banner advertisements on our websites and blogs. We will get traffic estimates very close to the actual traffic numbers on a page, the only condition is that website or blog should have buysellads script installed. So we can believe on the data available from BSA. To check website ranking, the only downside is that we can get estimated page impressions for a website selling advertisement through BSA. To know traffic details about a website, you need to click on the Your Ads here banner pointing to BuySellAds.com website. Here is a screenshot showing the kind of metrics you will get through BSA. The above screenshot gives you insights on seeing a website traffic detailed information including the website unique monthly visitors. A great place to spy on your competitors traffic and find their keywords. Finding website traffic is never an easy task especially if you are new to blogging world. Here’s where the above list of website traffic estimator tools help you find the accurate details of traffic that a website gets. SitePrice is originally created to know estimate worth of a website but it also can be useful for finding traffic of any website in the world. All you need to do is to enter any website’s URL to check its website traffic and you’ll find all the information you need. Quick note: Estimated daily unique visitors count provided on this traffic estimator tool is trying to be estimated using various tools including Alexa, Compete, Google Ad Planner and so on. Yes, the data is not 100% accurate but gives you an idea to estimate traffic of a site. If you want to check website traffic for free and don’t want to use any tool for that, here are some other website or blog traffic checker formulas that don’t need any paid tools. In fact, you can directly view their analytics screenshots etc without even letting them know. Since people are honest as far as business is concerned, you can get almost realtime website traffic details here. One demerit is that not all business pages are updated often and not all websites have this information on their website. So you can try your luck to find the website traffic. Below is a screenshot from the advertise page of Mashable.com which gives a clear idea of website traffic and traffic breakdown of the site. Here’s another handy tip for checking website traffic really quickly. It works almost every single time. We all know how powerful blog commenting is. Did you know that you can check any website traffic by leaving a comment on their posts? Once you comment on a WordPress blog, your browser redirects you to where your comment will show up. The number 108,656 says that you left the 108,656th comment on IncomeDiary.com. This number includes spam comments too. Assume that 75-90% of the comments are spam and now you can get an idea of how many real comments a site has.. If you observe top niche bloggers, you will see that they gave lot many interviews talking about how they built their site and what works for them. But, they will not share how much traffic they get and where it’s coming from. A lot of people are more open about sharing traffic stats. You can see this in interviews and archived articles on a blog there you will stumble upon a “blog in review” or “traffic report” post. With the help of those stats, you can start to figure out how much traffic the site is getting today. However, you can figure out how much traffic a website gets is to go to their Advertising page. Let’s say, if a blog is trying to sell advertising space, they must tell you exactly how many unique views and impressions your ad is going to get every month. So, this way also you can get monthly traffic estimation of your competitors. With PR News, you can predict the number of unique viewers that can read your post of any site or blog. They have Unique Viewers Estimator where they estimate unique readers of your article without using any plugins, cookies or user IDs. Just enter any domain and their Estimator will tell you how many readers can you expect. Here are few features of this site. It can predict the number of views your sponsored content can receive on a platform of your choice. It is also helpful for predicting the traffic of any website’s page and it is so effective even on those websites that hide their view counters. This site is also useful if you want to get some PR for your newly launched app, product, website or blog apart from checking any website traffic for free. Here are some of the very important questions you must know about website traffic estimator tools to check any website traffic for free in 2019 and beyond. 1. What are the best tools to check website traffic free online? The following are some of the best tools to check website traffic for free online in 2019 and beyond. SimilarWeb (a nice combination of both the above tools where you can also find demographics, user metrics, links and on). 2. What is the best way to track visitors to my website? So far we mostly covered how you can check traffic of your competitors websites but what if you want to track visitors of your own site? Is there any best way to track visitors of your own website? If you want to get detailed insights of your own website, we recommend you to check out the following tools as they all are excellent in website tracking. We highly recommend you to start using Google Analytics (it gives you a tracking code that you can install within your website) if you want to know accurate results of your site. By using Google analytics, you get access to the following things. 3. How do I find out how much my website is worth? You can use tools like SitePrice, Site Worth Traffic, Webuka etc to easily find how much worth a website is in terms of money. Remember that, the website worth is only helpful to know a website’s value but it doesn’t mean you can sell that website for that price (in some cases, even for new sites, some of these tools show millions dollars of worth!). 4. What are the best SimilarWeb alternative tools online? 5. What are the best website traffic generator tools? Are they any good? Website traffic generator tools, website traffic booster bots, traffic generator bots etc are all allow you to generate random traffic using bots. If you want to build a profitable blog that makes money, you should avoid such website traffic generator tools because you need to bring traffic organically and not by using any of such traffic generating bots and definitely they are of no use. 6. How accurate are website traffic estimators? That’s a fantastic question if you’re too keen in using website traffic estimators to check website traffic for free. Most of the traffic estimator tools don’t provide you accurate data (especially the free ones). Do you know why? They simply don’t invest more time or money in indexing the pages of a website (throughout the web) or updating their databases with latest information. Here’s where premium tools like SEMrush, Ahrefs come into play by providing as much accurate information as possible. In a nutshell, free website traffic estimation tools only give you an idea about how much approximate traffic a site gives (it’s not accurate information) whereas paid tools like SEMrush give you accurate data because of their largest and regularly updated databases. 7. How to find demographics of a website? If you’re a website traffic junkie like us, you’ll definitely not be satisfied only by knowing the traffic of a website and you’ll go beyond that by finding demographics of a site. If you’re wondering about how to find demographics (statistical data relating to the population of a region or country) of a website, here are few tools that will help you. Both Alexa and SimilarWeb give you free access to check demographics of any site. The rest mentioned tools i.e SEMrush and Ahrefs are premium tools but give you much more accurate information. From now on, use the above tools to check any website traffic for free. I hope the website traffic checker tools mentioned in this detailed article will help you estimate traffic of a website. I hope you now got the answer to your question “how to check website traffic” from this detailed guide. Don’t rely on just one website traffic checking tool, spend your time on trying out different sites, then find out yourself which is giving you the close numbers. Though I’m a big fan of Alexa to check any website’s traffic for free, but I use it more for fun to spy on the keywords of my competitors. So, give it a shot and try out all the above mentioned websites to find the website traffic. Important note: One of the easiest ways to find accurate results of any website traffic is to through Flippa! Just go to flippa and search your competitors websites on their search box, if they are selling their sites on Flippa, you will get their Google Analytics reports in PDF format. Basically these are the accurate results so that you can easily find out how many monthly visits they are getting, what keywords are bringing them top search results and what’s their bounce rates. So why not try your luck? Check out if their sites are listed on Flippa to find out their website traffic for free. This is how I used to check website traffic of any website of my interest. Do you any sites or tools that can be useful in finding the traffic of any website? Share your thoughts in the comments below. Wow.. there are so many tools to analyze traffic more than my knowledge. But I trust mostly on Semrush and Google Analytics. I think these are most accurate tools. I think it’s important to see what and how your competitors are performing, but also more impactful to optimize and increase conversion for your own business or company. Just my 2 cents, but a great post still! While checking website traffic, it’s a must to analyse your competitors top traffic sources. You should also make a list of all the keywords which are sending them the most organic traffic and sales. That’s how you can come up with great topic ideas to increase your search traffic and sales. Thanks for the comment. Nice article, semrush is the best tool, to figure out your website or competitor’s website. Furthermore you can use Moz Link explorer do check discover and lost linking and many more. That’s true. You have to login using your Google account. Google Keyword Planner works well for Chinese websites as well. Hey thanks for list. But I still find similar-web to be quite accurate for my website statistics. I will also give a try to other sites you have mentioned. Thanks for the list. I’ve also found statshow which analyses traffic and estimates revenue of the site. I’m not sure of the accuracy of the data though. Thanks Anil Sir! You are my real blogging teacher. Because of you, I have started my website. I want to increase traffic by buying afrefs. But, it’s price is too high. Is there any offer or cheap services. I’ve used all of them. But I like SEMRUSH because it gives more information than everyone else. Thank you for sharing this post Anil Agarwal. Nice Article About Check Website Traffic By Great Tools. I Am Using SEMrush Tool, It Works Best For Me. Please Share Some Keyword Research Technique For Hindi Blogger. semrush and Alexa is what I use to check my rank. I have been using SEMrush for the last 2 years and its really amazing. This SEO tool has fulfilled all of my SEO needs. Thank you so much for this popular post. I will be testing out your recommendation,SEMrush shortly. I checked and discovered that Compete.com has shut down. May be you will consider replacing them. What do you think? Emenike, we have removed compete.com from this list now. We will be updating this post soon to add more traffic estimating tools to help you find the traffic on any of your competitor website. Thanks for the great list of 5 Ways to determine traffic! I use Alexa to check my Blogs Status. But now it is not free anymore, you have to pay to take the Subscription of Alexa and even they increased the price from last month. I have tried Google Display Planner, but it asked me register a Adwords account, and I wanna know, does it work well with Hindi Websites ? Compete.com is not working. By the way I dont understand the ad planner video. Beside it, all the methods are Excellent. I realy aprisiate this post. SEO is in its nature difficult and any tools list is welcome. I must admit that for some of these tools I have not heard. Some of them I tried so I can say they are useful. Thanks for list and help! Hi, This is a very nice and informative article. Although there’s one issue. The website compete.com was shut down last year on 31st December 2016. Thanks for the article Anil. However, the accuracy of these tools is questionable. For example, when we take a look at a website with 100,000 visitors per month which means almost 75% of the time the most accurate tools will tell you those sites will have 75,000 or 150,000 visitors per month. However, these tools will help in analysis competitors. Although there is a huge discrepancy with accuracy, still it will somehow provide an insight on competitors growth. I have heard a lot about semrush will give it a try. By the way I will have to check two more products in this list. I’ve tried Ahrefs in the past but I have been hearing a lot about SEMrush lately and I think I’m going to give it a try for myself. All look like awesome tools Anil. Especially SEMrush. I am also breaking down LOL and checking stats more frequently. From a financial and traffic perspective, it aids you to be aware of stats to show you which direction you’re heading in. Thanks for sharing. Yea from money wise, you should definitely keep an eye on your site’s traffic stats because traffic is the lifeblood of any blog and also make sure to focus on using the RIGHT tools like SEMrush to find accurate traffic information of a site which really helps you analyse a site along with their backlink sources, top keywords and so on. Thanks for stopping by Ryan. Thanks Anil, i didnt ever think of using the others apart from the well known few, btw compete.com is closed now no longer exists used to be a awesome tool. Thanks for letting us know about it, I think now you can use any of the above mentioned tools to estimate traffic of a website really quickly. I also suggest you to check out similarweb as well. I think Google analytics is best to check our own website traffic. Otherwise of we want to check traffic of another websites I would prefer alexa. Alexa won’t give you accurate results, it mostly tells you the traffic coming from those browsers that have already installed Alexa toolbar but yes, it gives you an idea about how popular a site is. Apart from that, you can’t trust their traffic stats. Thanks for sharing this links. Although as you’ve said getting a 100% accuracy may not be possible, having simply an idea about the numbers of visitors a website attracts and their demographics is already a big help. People crave to estimate their website traffic. And it’s important to build the right strategy. I prefer Alexa over others. The best thing is to use the Jetpack plugin which allows you see the number of daily visitors to your blog. SEMrush can also be helpful. The list you have made consists many useful tools. Good set of tools here! I rely on Alexa and Similarweb and they are close to the original numbers. Quite handy to know any website’s traffic. But haven’t tested the rest. Are they still relevant? Yes go give them all a try. Both Alexa and similarweb are free but they don’t give you accurate estimation of website traffic. You’ll just get an idea about the traffic stats, you might want to check out tools like SEMrush for accurate data. Thanks for sharing such a great list of tools to check the traffic of someone else website as I am in a confusion as a guy is asking for the guest blog and is saying he is having a huge number of traffic but I don’t believe him as the rank of the site is not that good but now I ca check the reality and all thanks to you. Generally i use Alexa.com to check website traffic. it is so useful for getting all kind of information. I see many people ask me how to get information about blog traffic. I think this article definitely can solve their problems. However. thanks for sharing this great article. Keep it up. As I’ve been replying to all the comments here, most of the people are depending heavily on free sites like Alexa. Yes, it’s great for doesn’t provide you “accurate results” to find out traffic of a site. You can also use alternatives like similarweb which I think is a great free tool to estimate traffic of a site. Its a great listing of analytics but GoStats is an alternative to these tools. Its a free website analytics & hit counter. You can get exact report of visitors, pages views, demographics as it shows data in a real time. It has some managerial qualities & advance features. These are some good resources to spy on our competitors, sometimes I use similarweb to check competitors information but I never used, Google Adword planner and Flippa to know about the status of the website. This article really helps bloggers to know about the potential of competitors, thank you very much for sharing the info. I have tried Google Display Planner, but it asked me register a Adwords account, and I wanna know, does it work well with Chinese websites? But I’am little confusion between the Similar web and Alexa , because there we find a great difference for Alexa ranking. pls, tell me something about it. I know only Alexa and Google keyword planner but unaware of other 3 resources to find traffic to a website. You always share some remarkable stuff, keep doing it for us. I think I am not understanding this, does google ad planner gives traffic meaning visitors to some particular website? Meaning the number if visitors to that site in a month or week etc. google gives cookies – is it anywhere related to the number of visitors per month or week or year? I’ll make it clear for you: Google Ads Keyword Planner is a free keyword research tool provided by Google that allows you to find the right keywords to target for display ads, search ads, video ads and app ads, using Ads planner, you’ll only get an estimate of your own traffic stats, you can’t find other people’s site information. The above tools are helpful for finding traffic of any site. I doubt whether Alexa can be used to determine how successful a blog is as far traffic is concern. Alexa ranking is something which can be manipulated. Exactly, and that’s what I’ve been saying to all the commenters who are using Alexa for traffic estimation, it doesn’t provide you accurate results and yes as you said, it can be easily manipulated: https://bloggerspassion.com/how-to-improve-alexa-ranking-for-your-blog-dramatically/ (you can go through this post to know more about it). Thanks for stopping by. Abhijit Compete.com is working fine. I would recommend you try Compete.com for popular websites only. Please let me know in case you still find any problem in using it. You can give a try to Similarweb.com. I don’t think without tracking code isntalled(like statcounter, google analytics) any tool can tell you correct traffic figure. Atish no doubt without tracking code, we cannot get the correct traffic details about any website. But we have to rely on Similar Web kind of websites when we want to make judgement about our competitor websites traffic sources. Atish when you go to similarweb.com website, you will have some idea about traffic breakup for any popular website like their top organic and paid keywords, monthly visits and top referring websites etc. haha, that’s true. Most of these sites that provide you estimate earnings (my site is earnings millions every day according to them) are only for your personal satisfaction. They are not going to be useful for anything else, you should better avoid checking those sites. Performance data of my website is always important for me. I can make content creation plan more effectively. I start writing more contents on best performing keywords and sub topics. So, these tools are very important for me. Thank you for reminding me, there exist world more than Google Analytics. If you want to find your own traffic, it’s better to use tracking code and install Google analytics to know accurate information about your website. It tracks and reports website traffic, and gives you access to all the features and tools that you need to better understand your content and audience. Do let me know if you’ve any questions. Every blogger must have an idea which type of traffic he/she is actually getting on his blog and these tools are just awesome, besides these i love to use jetpack stat on my wordpress blog and allow me to confess, it help me to scale new heights. Keep posting such wonderful ideas for us. Yes, I agree with you completely Rakesh as monitoring your website’s traffic enables you to know who is visiting your website, where they are coming from and where they are going within your site – they all play a key role in understanding your audience even better so you can create the right kind of content and increase sales. Very useful article you posted here.but i have a another question. How can i determine total number of backlinks of a website with correct information. Google webmaster only shows the backlinks which are indexed by the Google.plz tell me if there is any particular free tool for that. Aditya I would say Google Webmaster Tools is the best way to find incoming links for your own websites. But when it comes about finding correct links for your competitors websites, you have to rely on Moz.com kind of paid SEO tools. No, it works for almost any country or region in the world and it’s one of the few tools that provide you accurate information about any site; You should check this out (https://bloggerspassion.com/unbiased-semrush-review/), using it you can easily do competitor analysis, keyword tracking, SEO audit, keyword research and much more. This is a very detailed post about checking stats. I will definitely check out some of the sites you’ve mentioned here. I so identify with what you’ve said about checking stats obsessively. I used to do that. Not anymore. I now spend my time in more value added things like creating valuable and original content, researching and learning how to promote my blog. Checking website traffic stats is an addiction for few bloggers (just like checking their email or insta notifications). There’s nothing wrong in that though but you can use your time productively by analysing other people’s site stats instead of your own. That way you might come up with profitable topic ideas to grow your own site’s traffic. All these are the nice way to calculate the traffic on website. Still I am using Alexa. Google Adplanner is quite complecated to me. I want to know more about the key concepts of this tool. would you please provide me some material for that so that i can easily use this wonderfull tool. and offcourse, great info shared by you. It will surely help to lot of newbies who want to make bright carrier in Digital marketing. Yes, Google ad planner is definitely complicated to use and only allows you to find the right keywords to target for display ads, search ads, video ads and app ads, it doesn’t let you find traffic of other sites. It’s definitely a no for beginner users or those who are looking for an easier option to estimate traffic of a site. I knew about BSA in the sense that they allow us to have their ads on our sites. However, I didn’t know those things that are mentioned here about BSA. Thanks for improving my knowledge. I tried to use google ad planner, but its not working and has been replaced by google with some another tool. can you please help in that case? Google Ad Planner is no more available. Its gone now. You need to use the other alternates that are available from the list. I will soon look at other ways we can use to get the estimated traffic on a website. Have always depended on Alexa rankings to know about a competing blog. Even though it is not possible to get the exact traffic estimate of you competing blog, a combination of the above mentioned tools can help to get a fair idea of your competitors. Thanks for checking out the list, yes, it’s definitely a huge post and as you said there are a ton of people who still depend on alexa ranking. To get accurate data you should check out tools like SEMrush: https://bloggerspassion.com/unbiased-semrush-review/ as it provides competitor analysis, keyword tracking, SEO audit, keyword research and much more. Google Analytics. If you have registered with Google Analytics, it will give accurate traffic and other details about you site. You can also link other Google tools like Google Adsense with the Analytics, to plan your business accordingly. Google Ad planner is really good. I have tried it and the analysis report has helped me a lot to figure out the inward traffic. But Alexa has disappointed me more than any thing else. Its been more than 9 months and still the figures are garbled and unclear. Is it necessary that I should install the Alexa tool bar to get real, authentic data? I think lots of people are able to increase their websites alexa rank artificially. And in case you want to see Alexa Rankings for a website, you can do so by installing the Search Status Ad On for Mozilla Firefox. You would not get much detailed analysis about a website traffic from Alexa. You should be using it to find the popularity and traffic trends in brief for that website. Nadeem, SEMRUSH.COM has a lot of information, but it’s not as accurate as Google Adplanner used to be. For example for our site they said that SE Traffic for US is 829 and according to Google Analytics is 44.974, and they said that SE Traffic for Spain is 58.590 and in Analytics is 175.799. Google Adplanner used to be really accurate, but with the recent change they don’t show that information anymore, and I would love to find a good site with accurate traffic information. By the way I haven’t found anything free better than semrush! That’s so true. As you said Google Adplanner was much more effective and used to be really accurate, but with the recent changes they aren’t showing much details, apart from that, you will get accurate data only for your own sites where the tracking code is installed. If you want to find other site’s traffic, you need to use the above mentioned tools. I’ve been using Google Ad Planner Traffic statistics since I discovered it on 2010 and I completely agree with you that the Traffic information they used to show was the best. Alexa, Compete, QuantCast they are good to get estimates, but their estimates are not good for websites outside US. Anyone knows a good alternative to Google Ad Planner with most of the Traffic statistics that they used to show? Well, it works on old sites, some new sites would have no information about traffic even if they been on a web and Google for about 6 months. You can only check your site traffic through Google analytics, but this info available to website owner only. Yes, that’s so true, if you want to find other’s traffic, you need to rely upon tools apart from Google (such as Alexa, SEMrush and so on). That being said, website traffic tracking and analysis helps you easily understand how your audience and content system works, and how you can benefit from outsourcing web analytics. I tried checking this website (www.academicpapers.us) but no information came through, except on Alexa, but even so, Alexa listed it in Pakistan, while DomainTools lists it in the USA. Why is this so? Frankly speaking, I don’t have any clear cut idea about why Alexa has listed this website in Pakistan. Other tools seems to be working for high traffic websites and blogs only. You will be able to get much data about websites that get few hundred visits every day type. One of the best website traffic checking tool in my opinion is Alexa very easy to use with lot of quality futures. If you are want to track traffic for a popular website, Google Ad Planner will give you more accurate traffic numbers. I am a new learner and find interesting to note the tools to check traffic on a website. I will try it and let you know. I want to have my own website on a traffic place. Could you identify it? Tariq, unable to understand your question properly. Please help me with your question again. I have been using Alexa.com and Google Analytics. Thanks for sharing others. And i tried Google Ad Planner, entered the website URL,clicked arrow mark, Still nothing came out. The best website traffic checker I know is Alexa.com. Thanks for sharing the others! I will be looking into Google Ad Planner since it’s number 1 in your list. I would recommend you must try Google Ad Planner. Google Ad Planner has been placed in first because it deserves this spot. Thank you for your post Anil. I use 4 or these 5 methods but I’ve never used Google Adplanner, thank you for let me know this. Google Ad Planner looks most promising to me. Hopefully you would also love it. I’ve been using Google AdPlanner too. It never failed my expectations on how efficient it is in performing its job. You should check it out. Very true. I’m a big fan of Google Ad Planner. I’m getting predictions very close to the actual traffic on a website through Google Ad Planner, amazing traffic prediction tool from Google.